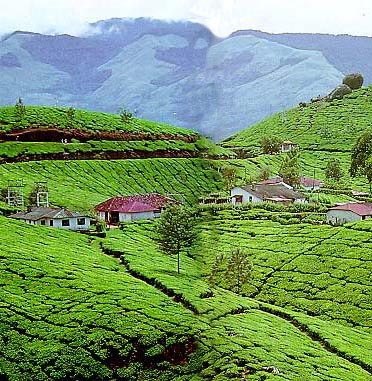 Munnar hill station is one of the most wonderful mountain tourist place in southern region of India. It is located on the Western Ghats, situated in the “Idukki“ district, Located in "God's own country" Kerala. This hill station, located at an altitude of 1600 m above sea level, this was once of the summer resort of the British government in South India. This beautiful hill station is popular for its cool climate and tea plantation, tea factories, wildlife sanctuaries and many lakes, dense forests, wildlife sanctuaries and covers most of the region. Pothamedu offers an excellent view of the tea, coffee and cardamom plantations in Munnar. The rolling hills, the cool mountain and the breathtaking scenery. This small hill station with its velvet lawns and cool mountain air. It is a beautiful place with lot of tea plantations. The Sita Devi Lake with its mineral waters and surroundings is a good picnic spot. The lake is also ideal for trout fishing. This is the venue of the first Hydro Electric project in Kerala. On working days it is possible to visit Hydro Electric project. A panorama of waterfalls and rolling hills, Attukal, located between Munnar and Pallivasal. The place is also ideal for long treks. Located between Munnar and Rajamala, Nyayamakad is a land of waterfalls. The waters fall down a hill from a height of about 1600 meters. Driving through the Kodaikanal Rd, Mauttupetty just 13km from Munnar situated at a height of 1700m. Mattupetty is known for its highly specialized dairy farm. Over 100 varieties of high yielding cattle can be seen here. Mattupetty has a beautiful rose garden. The Mattupetty Lake and dam is just a shot distance from the farm, is a very beautiful picnic sport and the Kundala Lake are other attractions. A small village with sleepy little cottages, bungalows, old playgrounds and courts. Home of the Pallyvasal hydel power project, this hill town is also famous for its picturesque tea plantations.